Road trips are more than just going from Point A to Point B in a car. Although that’s certainly part of it, the other part is stopping at fun and quirky roadside attractions along the way. And that’s exactly what we did on our drive through South Dakota and Minnesota. 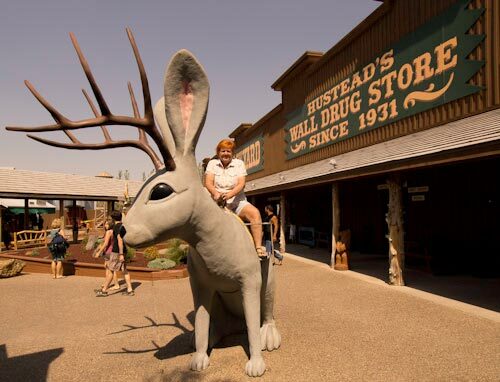 At the top of the list is Wall Drug Store in Wall, South Dakota. 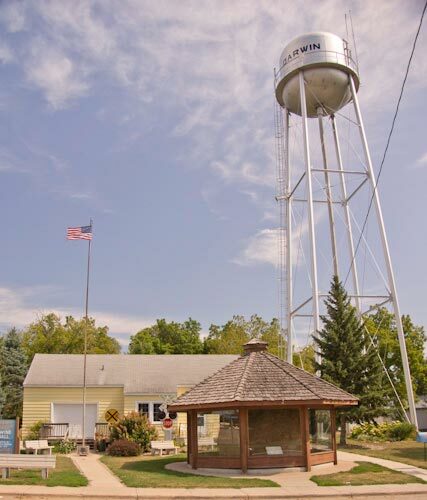 Dating back to 1931, this South Dakota icon began by offering free water to attract customers. Today it’s kind of a Disney experience, with lots of fun things for the whole family. It’s also the height of tackiness, but in a way that’s part of the fun. And with barrier-free access to the whole enchilada, it’s just a fun place to stop and explore, with plenty of photo ops – and some great people watching. 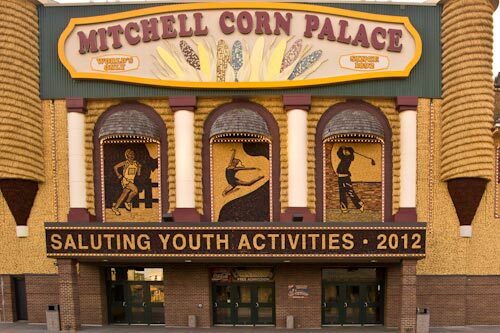 Located about three hours from Wall, the Corn Palace in Mitchell is another must- see. The original premise of this showplace was to showcase the bounty of the region, so everyone could see how fertile the soil was. To that end they decorated the outside of the building with bushels of corn, rye, oat heads and sour dock. As you can imagine, the corn murals don’t do too well in the South Dakota winters, so they put up new murals every year. 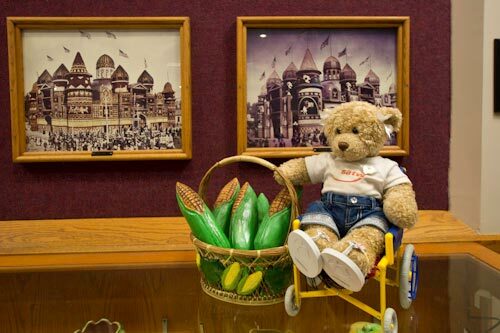 Cherrie also enjoyed the Corn Palace, as it has good wheelchair access. Accessible parking is available in the adjacent lot, and there is barrier-free access to this one of a kind attraction. It’s kind of fun to see photos of the old murals, and check out the inside of the building too, as it’s also decorated with corn. There’s no shortage of corn in South Dakota! 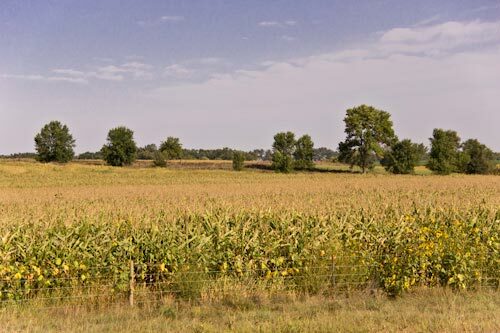 Just when we thought we had enough of corn, we kept on driving though acres and acres of it in South Dakota. I had flashbacks to Steven King’s Children of the Corn, but I put that in the back of my mind and stopped to admire the crops along the way. Nobody seemed to mind, and there were plenty of wide level areas to pull over. The World’s Largest Twine Ball — made by 1 person — in Darwin, Minnesota. Last but certainly not least, we had to stop at the World’s Largest Twin Ball in Darwin, Minnesota. To be clear, this twine ball is the largest one made by one man. There is actually a larger twine ball in Kansas, however it is a community effort. In any case, we found parking – not accessible – along the street, and curb-cut access to the twine ball, which is now housed in an glass-enclosed gazebo. There’s also ramp access to the adjacent museum, which contains exhibits on the area, and of course the twine ball. And although the restrooms are marked as accessible, the one-seater only has a wide door. Perhaps some folks could make do in an emergency, but it’s best not to plan this as a rest stop if you use a wheelchair. Still, it’s worth a short stop just to see the twine ball. In the end, you’ll find that there’s no shortage of accessible roadside attractions throughout the US – all you have to do is slow down and open your eyes. And like I said, that’s part of the magic of a road trip. As an added bonus, there’s no admission charge to any of these roadside attractions, so our adventure was very easy on the wallet too. This entry was posted in Attractions, Attractions, On The Cheap, Road Trips, Traveling Cherrie and tagged barrier-free, Corn Palace, Darwin, la, Mitchell, rgest Twine Ball, road trip, roadside attraction, SATW, slow walkers, South Dakota, Traveling Teddy, Wall Drug, wheelchair, wheelchair travel, wheelchair-access by Candy B. Harrington. Bookmark the permalink.